Why Is Mountain Dew So Bro? You’d be hard-pressed to find a soda more extreme than Mountain Dew. It’s kinetic. It’s raw. It’s daring. Guzzled by risk-takers, daredevils and mavericks who break rules and land on their feet no matter what hurdles they face, Mountain Dew is the ultimate beverage of unruly masculinity. At least, that’s the image they sell to men — men who drink it up. In my boyfriend’s favorite Mountain Dew ad from 2000, the one he recalls as the most influential to him as a tween, the beverage literally becomes a bullet that breaks windows and burns holes in chain-link fences before seamlessly landing in a skater’s hand mid-trick. “I always loved the ads. They made me feel like I could do those same stunts. And when I’d go to the X-Games, there were ads and samples everywhere,” he tells me. I began wondering about Mountain Dew’s bro-y identity long before I even met him, but I did notice an empty bottle of it in his apartment just a few nights ago. He also loves skateboarding, so I guess it makes sense. 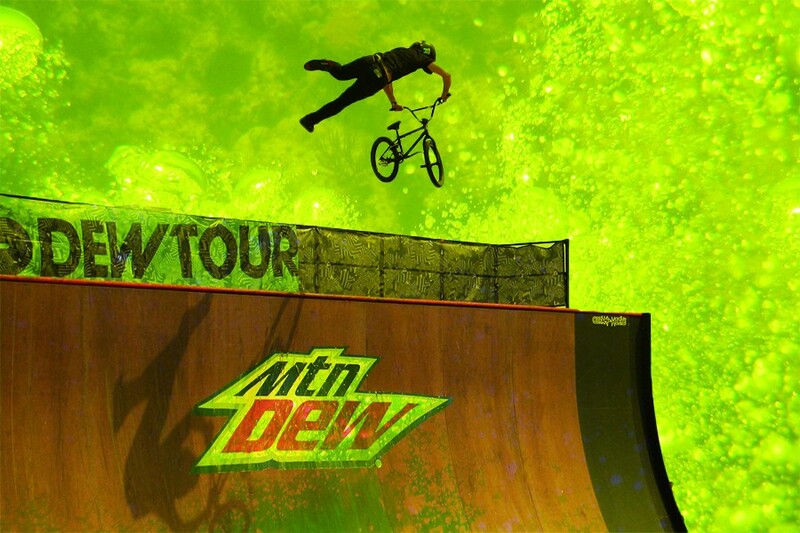 Lots of drinks have long been marketed to athletes, but Mountain Dew, with its weirdly unknowable nature and chartreuse color, has always catered to unconventional athletes — the rowdy skaters, rollerbladers and BMX racers of the world. In general, Mountain Dew fans tend to live in the South or Midwest, though it’s most popular somewhere in between (Kentucky) and was born in Tennessee (which, as this Appalachian writer shares, means plenty of ostracization when these fans move to either coast to pursue careers in fields that don’t involve wheels or boards). Although most people don’t know what Mountain Dew actually refers to, given it’s not a cola or a specifically fruit-derived drink like Orange Crush or lemon-lime Sprite, the term isn’t arbitrary. Irish and Scottish immigrants who moved to the Appalachian region to mine coal called their mixers for moonshine, off-market bourbon and whiskey, “Mountain Dew.” Barney and Ally Hartman started bottling their Mountain Dew in the 1930s and marketing it as whiskey’s best friend, meaning it’s had a pretty manly ad strategy from its inception. Bill Bruce [BBDO’s former chief creative officer]: When I came onboard, Seattle, as far as music, was blowing up with Nirvana and Soundgarden. There was a rebellion going on. MTV was playing some stuff from different athletic worlds. What jumped out at me was the idea of people just pushing themselves. Dave Burwick (former Mountain Dew manager and later PepsiCo CMO): He didn’t pick any sport in particular. We did everything from street luge to BASE jumping. … There was [even] a “Learn to Ride” program. When first-time snowboarders came down the mountain, we handed them a Mountain Dew. We were linking that first exhilarating experience on a snowboard with our product. John Galloway (former Mountain Dew brand manager and head of Pepsi’s sports division): I still remember the first Winter X Games. Each of us [sponsors] were assigned a 10-foot-by-10-foot booth space by ESPN. We got up there and said, “This is not us.” We sent our folks down to L.A. to get a speaker system to blow out this tent. We did a Mountain Dew slam race with people slamming Mountain Dew. We were seen as pretty rebellious. Looking to have it both ways, however, a couple years ago, Mountain Dew made a “Black Label” option, which Ad Week mistook as “classy” and the New York Post considered “hipster,” despite how obviously bro such an offering is, resembling both a Monster Energy Drink and a Mike’s Hard Lemonade. “With a can like this, you’ll love to show it off,” the first actor in the commercial promises. Despite the push for class, the ad plays to the same audience of bros and bro-hoes already obsessed with Monster and the Monster merch they get from redeeming their little green tabs. But even though Mountain Dew’s direct relationship to its audience means its branded content and overall identity is stronger than ever, not all of its old-school collaborators still stand by it. “I decided to leave Mountain Dew because I wanted to make healthier choices,” pro skater P-Rod (aka Paul Rodriguez) announced last year when departing the company to promote Villager, the coconut water brand he co-owns.